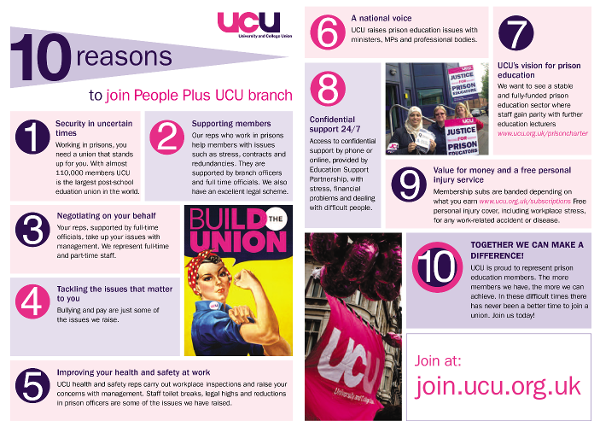 The 2019 UCU prison education annual meeting takes place on Friday 8 March in London, and each prison is entitled to send one person. If no one is attending from your prison and you would be interested please get in touch. PeoplePlus, Milton Keynes College and Novus have all agreed to provide paid time off for the member attending (arrangements with Weston College are under discussion). UCU covers the cost of travel and provides lunch on the day. Details about the day and registration can be found here. UCU's PeoplePlus prison education branch (formerly A4e) was established in November 2013. The committee meets regularly with managers to raise issues of concern to members. A network of reps allow the committee to keep in touch with members in just under 30 prisons where PeoplePlus delivers education services. This agreement came after many years of work, and finally secured paid facility time for our reps and H&S reps. Since the agreement has been signed we have been contacting members to gauge their key issues and have been out to visit PeoplePlus prisons to meet staff, and recruit new reps, H&S reps and members. We had our first quarterly meeting with management in July, and discussed a number of topics including the managing of sickness absence; the current calculation of holidays and pensions. If we are yet to visit your prison, and you would like us to arrange a meeting, please contact Jenny Lennox to see what can be organised. includes: Prison Education Framework, health and safety concerns, and more. These play a vital role - and we are always looking for more members to help out. Reps provide individual support to members (full training and support is provided) whereas contacts distribute information and raise our profile. For further details contact UCU national organiser, Ronnie Kershaw.